There are no specific skills needed for this tutorial beyond a basic comfort with the command line and using a text editor. Prior experience in developing web applications will be helpful but is not required. Getting all the tooling setup on your computer can be a daunting task, but not with Docker. Getting Docker up and running on your favorite OS (Mac/Windows/Linux) is very easy. The getting started guide on Docker has detailed instructions for setting up Docker on Mac/Windows/Linux. If you’re using Docker for Windows make sure you have shared your drive. If you’re using an older version of Windows or MacOS you may need to use Docker Machine instead. All commands work in either bash or Powershell on Windows. Now that you have everything setup, it’s time to get our hands dirty. In this section, you are going to run a container from Alpine Linux (a lightweight linux distribution) image on your system and get a taste of the docker run command. But wait, what exactly is a container and image? Containers - Running instances of Docker images — containers run the actual applications. A container includes an application and all of its dependencies. It shares the kernel with other containers, and runs as an isolated process in user space on the host OS. Images - The file system and configuration of our application which are used to create containers. To find out more about a Docker image, run docker inspect hello-world. In the demo above, you could have used the docker pull command to download the hello-world image. However when you executed the command docker run hello-world, it also did a docker pull behind the scenes to download the hello-world image with latest tag (we will learn more about tags little later). Similar to docker run hello-world command in the demo above, docker run alpine ls -l command fetches the alpine:latest image from the Docker registry first, saves it in our system and then runs a container from that saved image. Let’s try something more exciting. $ docker run alpine echo "Hello world"
OK, that’s some actual output. In this case, the Docker client dutifully ran the echo command in our alpine container and then exited it. If you’ve noticed, all of that happened pretty quickly. Imagine booting up a virtual machine, running a command and then killing it. Now you know why they say containers are fast! Wait, nothing happened! Is that a bug? Well, no. These interactive shells will exit after running any scripted commands such as sh, unless they are run in an interactive terminal - so for this example to not exit, you need to docker run -it alpine sh. You are now inside the container shell and you can try out a few commands like ls -l, uname -a and others. Before doing that, now it’s time to see the docker ps command which shows you all containers that are currently running. What you see above is a list of all containers that you ran. Notice that the STATUS column shows that these containers exited a few minutes ago. Running the run command with the -it flags attaches us to an interactive tty in the container. Now you can run as many commands in the container as you want. Take some time to run your favorite commands. Exit out of the container by giving the exit command. Great! so you have now looked at docker run, played with a Docker containers and also got the hang of some terminology. Armed with all this knowledge, you are now ready to get to the real stuff — deploying web applications with Docker. Let’s start by taking baby-steps. First, we’ll use Docker to run a static website in a container. The website is based on an existing image and in the next section we will see how to build a new image and run a website in that container. 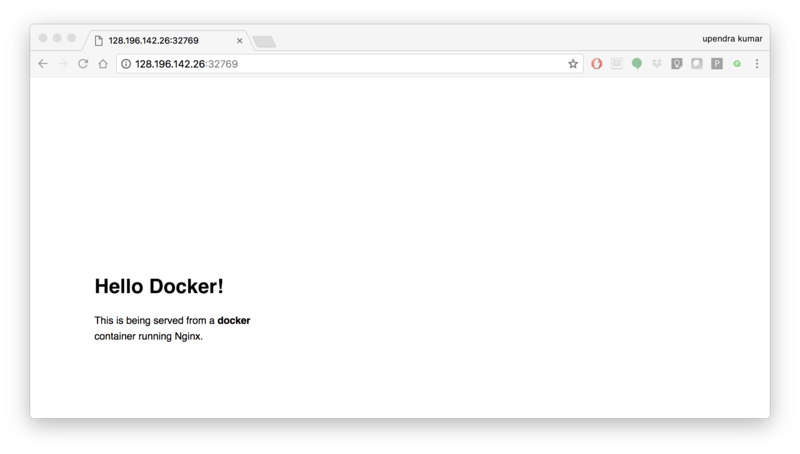 We’ll pull a Docker image from Dockerhub, run the container, and see how easy it is to set up a web server. The image that you are going to use is a single-page website that was already created for this demo and is available on the Dockerhub as dockersamples/static-site. You can pull and run the image directly in one go using docker run as follows. The -d flag enables detached mode, which detaches the running container from the terminal/shell and returns your prompt after the container starts. So, what happens when you run this command? Since the image doesn’t exist on your Docker host (laptop/computer), the Docker daemon first fetches it from the registry and then runs it as a container. Now that the server is running, do you see the website? What port is it running on? And more importantly, how do you access the container directly from our host machine? Actually, you probably won’t be able to answer any of these questions yet! ☺ In this case, the client didn’t tell the Docker Engine to publish any of the ports, so you need to re-run the docker run command to add this instruction. Let’s re-run the command with some new flags to publish ports and pass your name to the container to customize the message displayed. We’ll use the -d option again to run the container in detached mode. First, stop the container that you have just launched. In order to do this, we need the container ID. Since we ran the container in detached mode, we don’t have to launch another terminal to do this. Run docker ps to view the running containers. Check out the CONTAINER ID column. You will need to use this CONTAINER ID value, a long sequence of characters, to identify the container you want to stop, and then to remove it. The example below provides the CONTAINER ID on our system; you should use the value that you see in your terminal. A cool feature is that you do not need to specify the entire CONTAINER ID. You can just specify a few starting characters and if it is unique among all the containers that you have launched, the Docker client will intelligently pick it up. Now you can see the ports by running the docker port command. Laptop or Native linux: http://localhost:[YOUR_PORT_FOR 80/tcp]. On my system this is http://localhost:32773. Cloud server: If you are running the same set of commands on Atmosphere/Jetstream or on any other cloud service, you can open ipaddress:[YOUR_PORT_FOR 80/tcp]. On my Atmosphere instance this is http://128.196.142.26:32769/. We will see more about deploying Docker containers on Atmosphere/Jetstream Cloud in the Advanced Docker session. If you are running Docker for Mac, Docker for Windows, or Docker on Linux, you can open http://localhost:[YOUR_PORT_FOR 80/tcp]. For our example this is http://localhost:8088. If you see “Hello Docker!” then you’re done! Let’s stop and remove the containers since you won’t be using them anymore. Run docker ps to make sure the containers are gone. One area where Docker shines is when you need to use a command line utility that has a large number of dependencies. In this section, let’s dive deeper into what Docker images are. Later on we will build our own image and use that image to run an application locally (deploy a dynamic website). Docker images are the basis of containers. 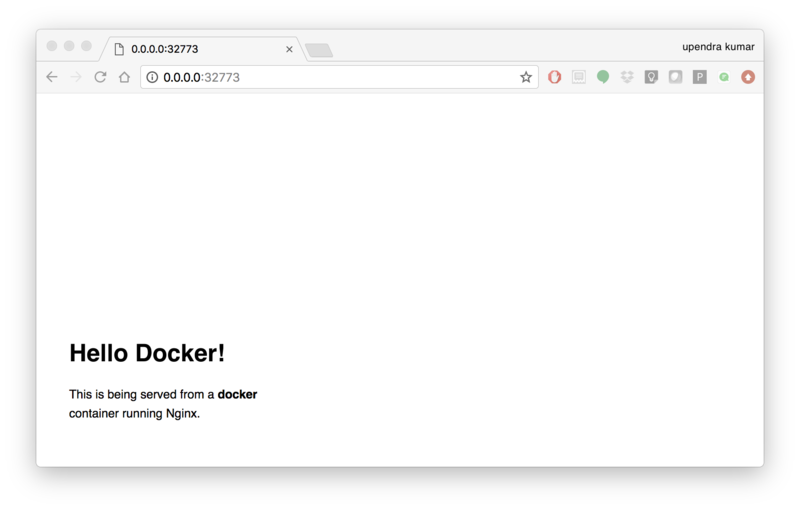 In the previous example, you pulled the dockersamples/static-site image from the registry and asked the Docker client to run a container based on that image. To see the list of images that are available locally on your system, run the docker images command. Above is a list of images that I’ve pulled from the registry and those I’ve created myself (we’ll shortly see how). You will have a different list of images on your machine. The TAG refers to a particular snapshot of the image and the ID is the corresponding unique identifier for that image. For simplicity, you can think of an image akin to a git repository - images can be committed with changes and have multiple versions. When you do not provide a specific version number, the client defaults to latest. If you do not specify the version number of the image, as mentioned, the Docker client will default to a version named latest. To get a new Docker image you can either get it from a registry (such as the Docker hub) or create your own. There are hundreds of thousands of images available on Docker hub. You can also search for images directly from the command line using docker search. An important distinction with regard to images is between base images and child images and official images and user images (Both of which can be base images or child images.). Base images are images that have no parent images, usually images with an OS like ubuntu, alpine or debian. Official images are Docker sanctioned images. Docker, Inc. sponsors a dedicated team that is responsible for reviewing and publishing all Official Repositories content. This team works in collaboration with upstream software maintainers, security experts, and the broader Docker community. These are not prefixed by an organization or user name. In the list of images above, the python, node, alpine and nginx images are official (base) images. To find out more about them, check out the Official Images Documentation. User images are images created and shared by users like you. They build on base images and add additional functionality. Typically these are formatted as user/image-name. The user value in the image name is your Dockerhub user or organization name. Now that you have a better understanding of images, it’s time to create an image that sandboxes a small Flask application. Flask is a lightweight Python web framework. We’ll do this by first pulling together the components for a random cat picture generator built with Python Flask, then dockerizing it by writing a Dockerfile and finally we’ll build the image and run it. 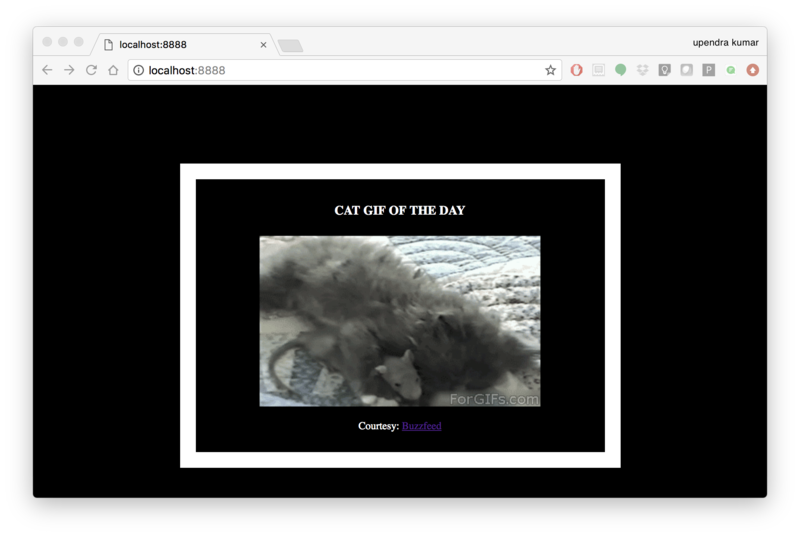 For the purposes of this workshop, we’ve created a fun little Python Flask app that displays a random cat .gif every time it is loaded - because, you know, who doesn’t like cats? Create the app.py file with the following content. You can use any of favorite text editor to create this file. You should then be able to open a web browser, go to http://localhost:5000, and see the message “Hello! I am a Flask application”. A Dockerfile is a text file that contains a list of commands that the Docker daemon calls while creating an image. The Dockerfile contains all the information that Docker needs to know to run the app — a base Docker image to run from, location of your project code, any dependencies it has, and what commands to run at start-up. It is a simple way to automate the image creation process. The best part is that the commands you write in a Dockerfile are almost identical to their equivalent Linux commands. This means you don’t really have to learn new syntax to create your own Dockerfiles. We want to create a Docker image with this web app. As mentioned above, all user images are based on a base image. Since our application is written in Python, we will build our own Python image based on Alpine. We’ll do that using a Dockerfile. Now let’s see what each of those lines mean..
1.4.4. Copy the files you have created earlier into our image by using COPY command. 1.4.5. Specify the port number which needs to be exposed. Since our flask app is running on 5000 that’s what we’ll expose. The primary purpose of CMD is to tell the container which command it should run by default when it is started. Now that you have your Dockerfile, you can build your image. The docker build command does the heavy-lifting of creating a docker image from a Dockerfile. When you run the docker build command given below, make sure to replace <YOUR_DOCKERHUB_USERNAME> with your username. This username should be the same one you created when registering on Docker hub. If you haven’t done that yet, please go ahead and create an account in Dockerhub. $ docker build -t $YOUR_DOCKERHUB_USERNAME/myfirstapp . You are using pip version 9.0.0, however version 9.0.1 is available. If you don’t have the alpine:3.5 image, the client will first pull the image and then create your image. Therefore, your output on running the command will look different from mine. If everything went well, your image should be ready! Run docker images and see if your image $YOUR_DOCKERHUB_USERNAME/myfirstapp shows. When Docker can successfully build your Dockerfile, test it by starting a new container from your new image using the docker run command. Don’t forget to include the port forwarding options you learned about before. Head over to http://localhost:8888 and your app should be live. Hit the Refresh button in the web browser to see a few more cat images. Here’s a quick summary of the few basic commands we used in our Dockerfile. FROM starts the Dockerfile. It is a requirement that the Dockerfile must start with the FROM command. Images are created in layers, which means you can use another image as the base image for your own. The FROM command defines your base layer. As arguments, it takes the name of the image. Optionally, you can add the Dockerhub username of the maintainer and image version, in the format username/imagename:version. COPY copies local files into the container. EXPOSE creates a hint for users of an image which ports provide services. It is included in the information which can be retrieved via $ docker inspect <container-id>. The EXPOSE command does not actually make any ports accessible to the host! Instead, this requires publishing ports by means of the -p flag when using docker run. If you want to learn more about Dockerfiles, check out Best practices for writing Dockerfiles. 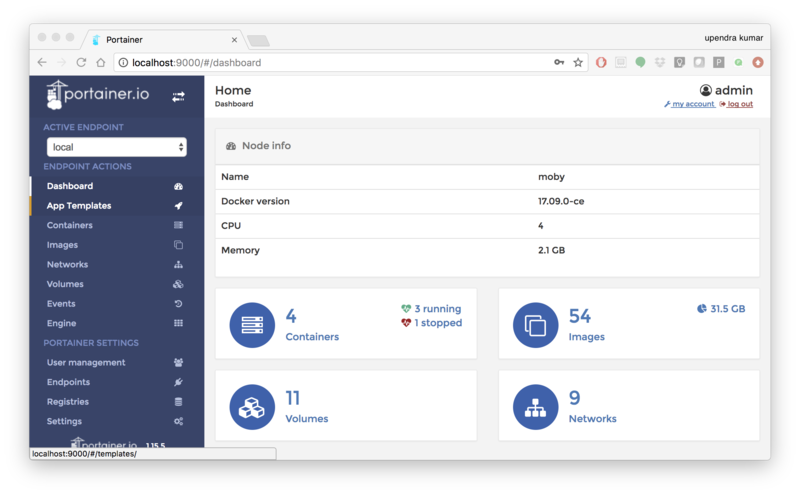 Portainer is an open-source lightweight managment UI which allows you to easily manage your Docker hosts or Swarm cluster. Simple to use: It has never been so easy to manage Docker. Portainer provides a detailed overview of Docker and allows you to manage containers, images, networks and volumes. It is also really easy to deploy, you are just one Docker command away from running Portainer anywhere. Made for Docker: Portainer is meant to be plugged on top of the Docker API. It has support for the latest versions of Docker, Docker Swarm and Swarm mode. Use the following Docker commands to deploy Portainer. Now the second line of command should be familiar to you by now. We will talk about first line of command in the Advanced Docker session. The -v /var/run/docker.sock:/var/run/docker.sock option can be used in mac/linux environments only. PWD is a Docker playground which allows users to run Docker commands in a matter of seconds. It gives the experience of having a free Alpine Linux Virtual Machine in browser, where you can build and run Docker containers and even create clusters in Docker Swarm Mode. Under the hood, Docker-in-Docker (DinD) is used to give the effect of multiple VMs/PCs. 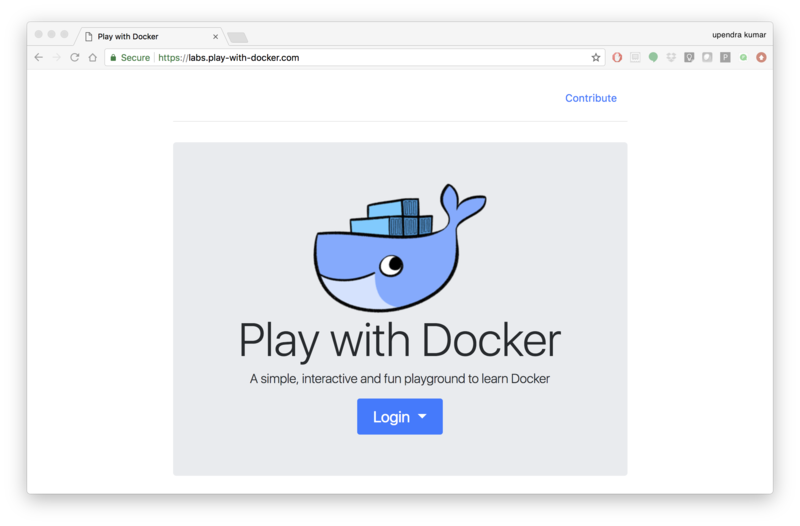 In addition to the playground, PWD also includes a training site composed of a large set of Docker labs and quizzes from beginner to advanced level available at training.play-with-docker.com.